Thank you for your support! We have raised enough donations to be able to open sometime this Spring of 2019! Current donations and pledges are at $3.2 million! Camp of the Cross has grown from being just a summer camp to being a year-round camp. We are doing ministry all year round and enriching people's lives of all ages with experiences that let them relax and hear God's Call in their lives. In addition to campfires and time outdoors, so much ministry happens around a good meal. The original dining hall was not meant to be a permanent structure—but we’ve squeezed a lot of life out of it through the years. Now, as it continues to deteriorate beyond repair, it is putting our ministry at risk. We are in a race against time before we can no longer repair the 60+ year old Dining Hall, originally built as a temporary structure. The heating system, the floors, the roof, everything has been patched and fixed over the years. During summer rain storms, the whole camp comes into the dining hall for camp activities. Kids have to dodge the buckets under leaks when it rains. Most of our kitchen equipment has come in used, and while it worked originally, it has all slowly gone out of order. Either that or it breaks down regularly. We’re pushing the envelope on the life of the building. Further damage or wear to the roof or floor or kitchen appliances would cripple our ministry. 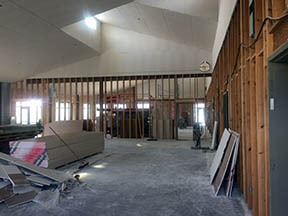 We were very faithful in using the current Dining Hall long as we possibly could—now it’s time to finish the race and complete the new Fellowship Center! Here is an opportunity to enhance God’s ministry here at Camp of the Cross, in a way that will last for generations. 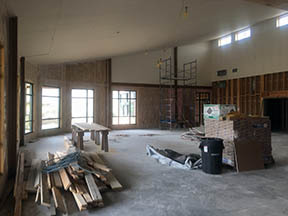 We are most of the way finished with our beautiful new Fellowship Center thanks to a lot of support from people who have been touched by the ministries of Camp of the Cross. People like you have lead the charge to raise over $2.6 million dollars and get their hands dirty helping prepare, dig, and build the Fellowship Center! We designed everything so that people will feel comfortable in this place, to enter into rest and relaxation and find the time to reconnect with Christ. This is a gift to Lutherans and all people of faith. 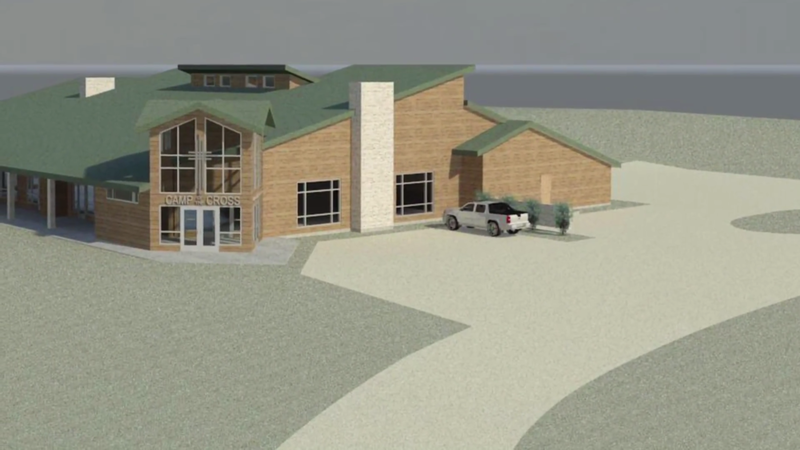 The new Fellowship Center will be more than a place to eat. It will be a place for meetings, conversations, and ministry to continue. We don’t have that place currently. We have great facilities for lodging, outdoor activities, campfires, and more—but we don’t have a place where everything can come together. This is where are ministry will come together for years to come. A place where you won't get dripped on when it rains! In order to continue building, there's no two ways about it, we need your help. Let's get this thing built! This is more than a building, it's the next generation of ministry at Camp of the Cross. The larger space gives us increased ability to host retreats and gatherings all year round. Please consider investing in the future of our ministry. We know we will reach our goal! However, the reality is that we need your help to finish this project sooner rather than later. 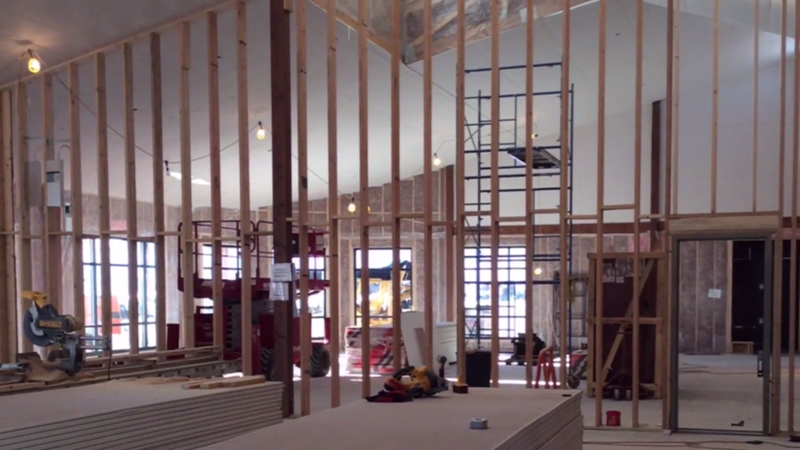 The clock is ticking on the old Dining Hall, please consider helping us Finish the Race!